Wake up at 6am if you're Kristen to hear other hostel occupants slamming doors and bounding up and down steps. Wake up at 7:30 if you're Charlton because he was smart enough to bring earplugs. Next get ready and get breakfast at Mister Donut.After one glazed donut, six donut holes and one curry, yes curry donut, hop on the JR Osaka loop to go to the Cup of Noodles museum. Enjoy listening about the history of instant noodles including a cafe at the end where you can eat your very own bowl. It's just like it's 1am in college and the only thing in your dorm room is your Psychology 101 book. Head to Japanese Mint. Make sure you take the extra long way to get there so that way you're really tired once you arrive. Take a look at new coins, old coins, unique coins and common coins. Wonder why you can't read any Japanese as all the signs are in Japanese. Contemplate purchasing Japanese Collector's Book for 47 commemorative prefecture coins. Next, go to gianormus electronics store and get overwhemed by the people, quantity of electronics, number of toys etc. Go to hostel to rest. 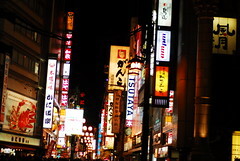 Head out to Dontonbori to see the nightlife and giant mechanical crab. Walk through huge throngs of people and take many interesting pictures. Succumb to my American desires for McDonald's for dinner. Enjoy the taste of McDonald's french fries but still keep somewhat Japanese by ordering a McCheese Katsu burger. Go back to hostel to prepare for a long day tomorrow at Himeji Castle and Kurashiki.